The minimum length string you want crunch to start at. This option is required even for parameters that won't use the value. The maximum length string you want crunch to end at. This option is required even for parameters that won't use the value. You may specify character sets for crunch to use on the command line or if you leave it blank crunch will use the default character sets. The order MUST BE lower case characters, upper case characters, numbers, and then symbols. If you don't follow this order you will not get the results you want. You MUST specify either values for the character type or a plus sign. NOTE: If you want to include the space character in your character set you must escape it using the \ character or enclose your character set in quotes i.e. "abc ". See the examples 3, 11, 12, and 13 for examples. will generate 4 files: aaaa-gvfed.txt, gvfee-ombqy.txt, ombqz-wcydt.txt, wcydu-zzzzz.txt valid values for type are kb, mb, gb, kib, mib, and gib. The first three types are based on 1000 while the last three types are based on 1024. NOTE There is no space between the number and type. For example 500mb is correct 500 mb is NOT correct. will result in 2 files: a-7.txt and 8-\ .txt The reason for the slash in the second filename is the ending character is space and ls has to escape it to print it. Yes you will need to put in the \ when specifying the filename because the last character is a space. Limits the number of duplicate characters. -d 2@ limits the lower case alphabet to output like aab and aac. aaa would not be generated as that is 3 consecutive letters of a. The format is number then symbol where number is the maximum number of consecutive characters and symbol is the symbol of the the character set you want to limit i.e. @,%^ See examples 17-19. When you use the -t option this option tells crunch which symbols should be treated as literals. This will allow you to use the placeholders as letters in the pattern. The -l option should be the same length as the -t option. See example 15. Merged with -p. Please use -p instead. Tells crunch to generate words that don't have repeating characters. By default crunch will generate a wordlist size of #of_chars_in_charset ^ max_length. This option will instead generate #of_chars_in_charset!. The ! stands for factorial. For example say the charset is abc and max length is 4. 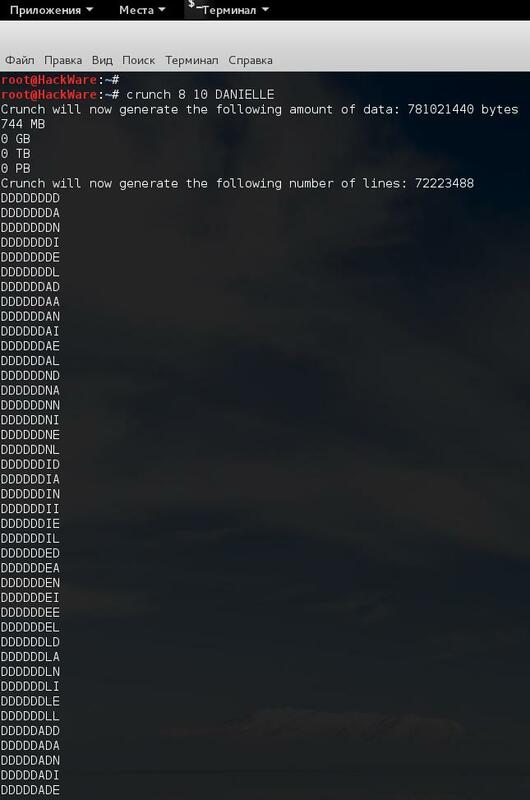 Crunch will by default generate 3^4 = 81 words. This option will instead generate 3! = 3x2x1 = 6 words (abc, acb, bac, bca, cab, cba). THIS MUST BE THE LAST OPTION! This option CANNOT be used with -s and it ignores min and max length however you must still specify two numbers. Tells crunch to read filename.txt and permute what is read. This is like the -p option except it gets the input from filename.txt. Tells crunch to resume generate words from where it left off. -r only works if you use -o. You must use the same command as the original command used to generate the words. The only exception to this is the -s option. If your original command used the -s option you MUST remove it before you resume the session. Just add -r to the end of the original command. Specifies a pattern, eg: @@god@@@@ where the only the @'s, ,'s, %'s, and ^'s will change. The -u option disables the printpercentage thread. This should be the last option. Compresses the output from the -o option. 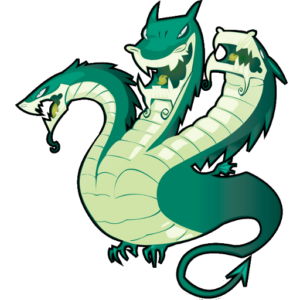 Valid parameters are gzip, bzip2, lzma, and 7z. gzip is the fastest but the compression is minimal. bzip2 is a little slower than gzip but has better compression. 7z is slowest but has the best compression. Example 8. The numbers aren't processed but are needed. crunch will generate birdcatdog, birddogcat, catbirddog, catdogbird, dogbirdcat, dogcatbird. Example 10. will generate 4 files: aaaa-gvfed.txt, gvfee-ombqy.txt, ombqz-wcydt.txt, wcydu-zzzzz.txt the first three files are 20MBs (real power of 2 MegaBytes) and the last file is 11MB. there is a space at the end of the above string the output will start at 11a! and end at "33z ". The quotes show the space at the end of the string. Example 16. crunch will generate 5 character strings starting with @4#S2 and ending at @8 Q2. The output will be broken into 10KB sized files named for the files starting and ending strings. Example 17. crunch will generate 5 character strings staring with aab00 and ending at zzy99. Notice that aaa and zzz are not present. Example 18. crunch will generate 10 character strings starting with aab!0001!! and ending at zzy 9998 The output will be written to 20mb files. Example 19. crunch will gernerate 8 characters that limit the same number of lower case characters to 2. Crunch will start at aabaabaa and end at zzyzzyzz. Example 20. crunch will load some japanese characters from the unicode_test character set file. The output will start at @日00 and end at @語99. 1. Starting in version 2.6 crunch will display how much data is about to be generated. In 2.7 it will also display how many lines will be generated. Crunch will now wait 3 seconds BEFORE it begins generating data to give you time to press Ctrl-C to abort crunch if you find the values are too large for your application. 2. I have added hex-lower (0123456789abcdef) and hex-upper (0123456789ABCDEF) to charset.lst. 3. Several people have requested that I add support for the space character to crunch. crunch has always supported the space character on the command line and in the charset.lst. To add a space on the command line you must escape it using the / character. See example 3 for the syntax. You may need to escape other characters like ! or # depending on your operating system. 4. Starting in 2.7 if you are generating a file then every 10 seconds you will receive the % done. 5. Starting in 3.0 I had to change the -t * character to a , as the * is a reserved character. You could still use it if you put a \ in front of the *. Yes it breaks crunch's syntax and I do my best to avoid doing that, but in this instance it is easier to make the change for long term support. 7. Crunch says The maximum and minimum length should be the same size as the pattern you specified, however the length is set correctly. This usually means your pattern contains a character that needs to be escaped. In bash you need to escape the followings: &, *, space, \, (, ), |, ', ", ;, <, >. If you want to use the " in your pattern you will need to escape it like this: crunch 4 4 -t "&*\"@"
Please note that different terminals have different escape characters and probably have different characters that will need escaping. Please check the manpage of your terminal for the escape characters and characters that need escaping. 8. When using the -z 7z option, 7z does not delete the original file. You will have to delete those files by hand.